Good news for all of you who missed out on TubeBox Pro, a great app that was pulled from the App Store a couple weeks ago. A re-release under a new name, Instatube ($1.99) is now available . Download it now before it gets pulled like its predecessor. It works exactly like the second release of TubeBox Pro, but adds VIMEO to its selection of videos (along with YouTube and Dailymotion). Vimeo definitely has a different “feel” to its videos, with less users overall than YouTube. Vimeo seems to cater to a more “professional”-style and film-making niche. It does not contain commercial-type videos and seems to attract uploaders who do not wish for the larger mass audience that YouTube brings. 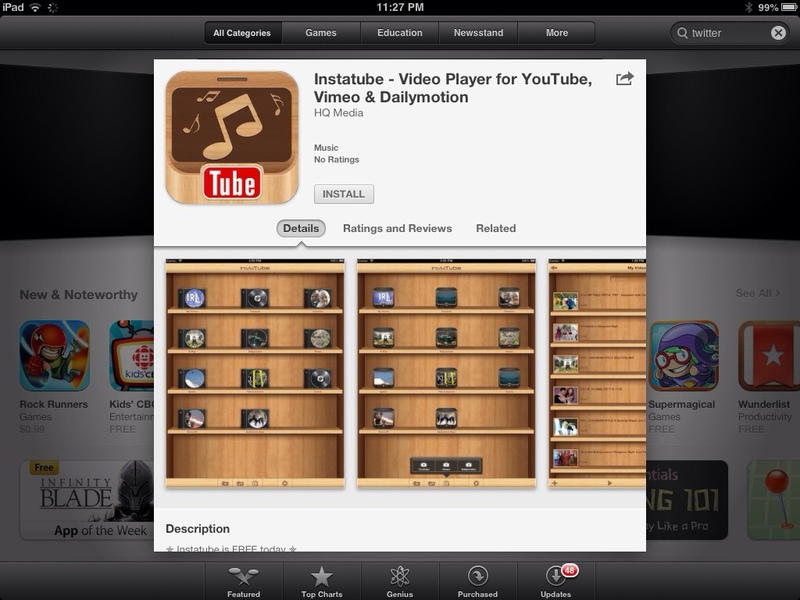 All the features that I shared about TubeBox Pro will be the same here with Instatube. Saving videos locally to your device remains a godsend for me, both in the classroom and with my toddler. Instead of having to use data with the YouTube app while on the road, I save any videos that I know my daughter will want to watch. Watching a saved (cached) video will not use up any data. Deleting videos I’ve saved is easy. Simply tap on the video you want to remove and swipe to the right. You will have a choice to either rename or delete it off your device. This screenshot below shows how to delete a video that is saved. For steps on how to save video, please refer back to my TubeBox Pro post. **Special thanks to reader Justin who let me know of the re-release! Once deleted it is gone. Pay the dollar for instatube. I can’t use the YouTube on my instatube why? Youtube has cracked down. No more of these types of apps!